They stood and stared at the water, over the beach, and she knew she had to go into the water, at least step into it. So she swung down, onto the sand and left her parents and brother standing on the sidewalk. Over the rocks and bramble from the sea. She went down to the very edge of the shoreline and stripped off her sneakers and socks, knowing full well how cold the water would be. She stepped into the wet and tried to imagine, in vain, her great-grandfather in the same spot. The same shore. The same blue-green water, the Mediterranean, the bustling little city of Bagnara Calabra. She liked to think her imagination was a good one but the images wouldn’t come- she lacked the knowledge of his years and felt like any rendering of the town in the turn of the 20th century would be pale, wrong. She was content instead to know that he had looked out over the same view where she stood now. The sea, at the very least, was unchanged. It was enough, for the moment. I’m writing this at the very end of a very long and stressful week. And the stress, it just will not let go. Right now, it’s wrapped its long tentacles around my very good friend who is supposed to be on her way for a weekend visit and instead is stuck on a flight from Miami to Philadelphia where she will assuredly miss her connecting flight to Maine and have to stay the night. So for the moment, there is just the humming silence of my apartment (that still needs to be cleaned), the mist and fog outside giving way to darker skies and the hope that the tentacles will release us both so maybe I can find my way to having something to eat. And miles away in Chicago, at least I have the knowledge that Nicole is home now, home from an anniversary trip in Charleston (they went to Husk!) 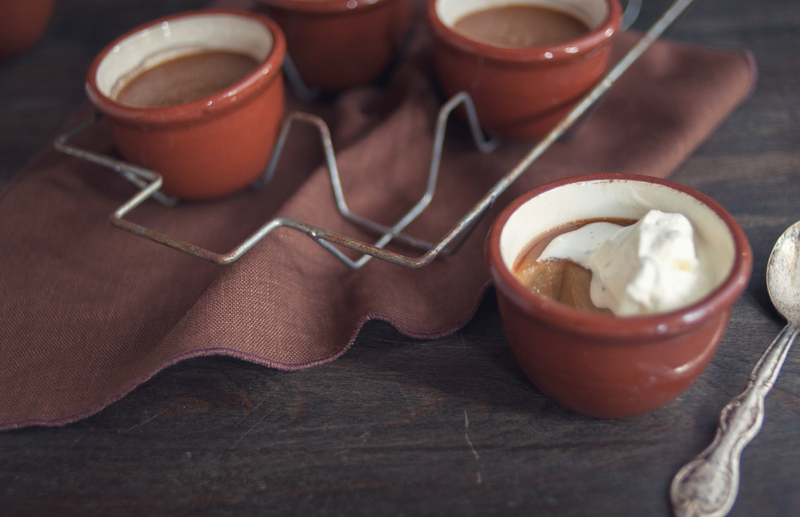 and tucking into one of these little pudding cups. She IMed me as soon as they were out of the oven and I’m feeling so chilled at the moment that I think they might be just what I need, crackling with salt, sweet and creamy warm. 1.Position oven rack in middle of oven and preheat oven to 300°F. 2. Bring cream, muscovado sugar, and salt just to a simmer in a small heavy saucepan over moderate heat, stirring until sugar is dissolved. 3. Bring water and Demerara sugar to a boil in a 2-quart heavy saucepan over moderate heat, stirring until sugar is dissolved. Continue to cook, stirring occasionally, until browned and bubbly, about 5 minutes. 4. Remove from heat and carefully add cream mixture (mixture will bubble up and steam), whisking until combined. 5. In a large bowl, whisk together egg yolks and vanilla, then add hot cream mixture in a stream, whisking. Pour custard through a fine-mesh sieve into a 1-quart glass measure. Skim off any foam with a spoon. 6. Divide custard among ramekins. 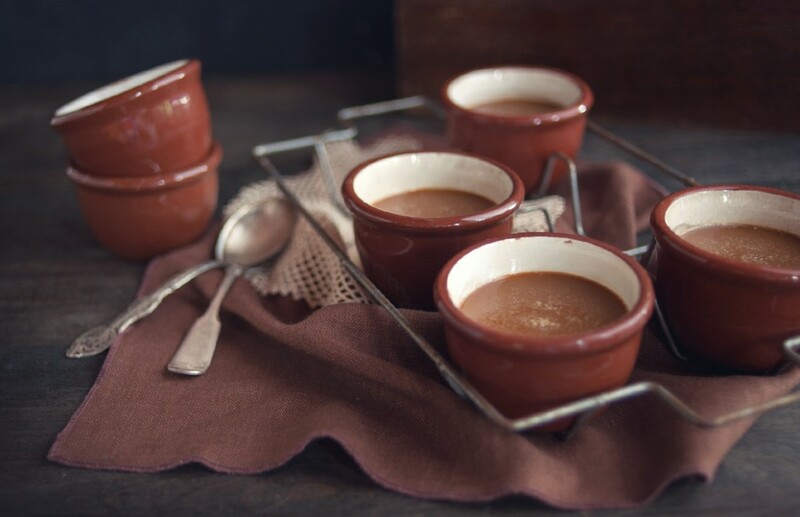 Arrange ramekins in a small roasting pan and bake in a hot water bath, uncovered, until custards are set around edges but still tremble slightly in centers, about 40 minutes. 7. Transfer ramekins to a rack with tongs and cool to warm or room temperature. 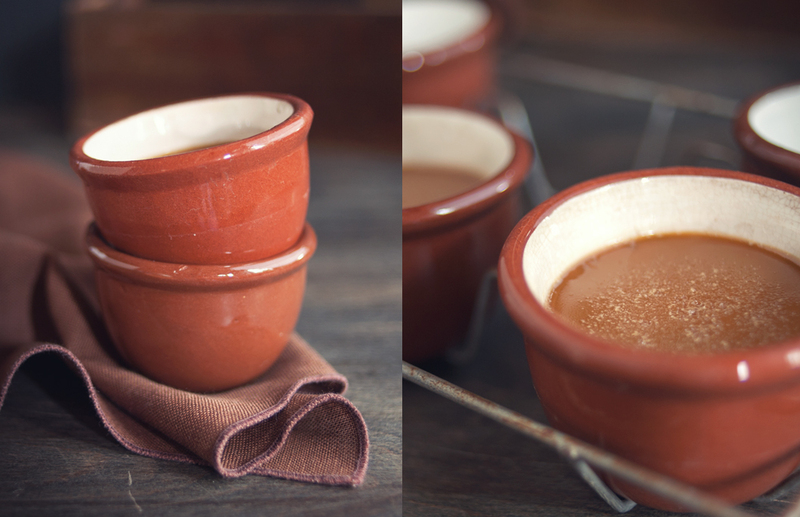 Pots de creme will continue to set as they cool.